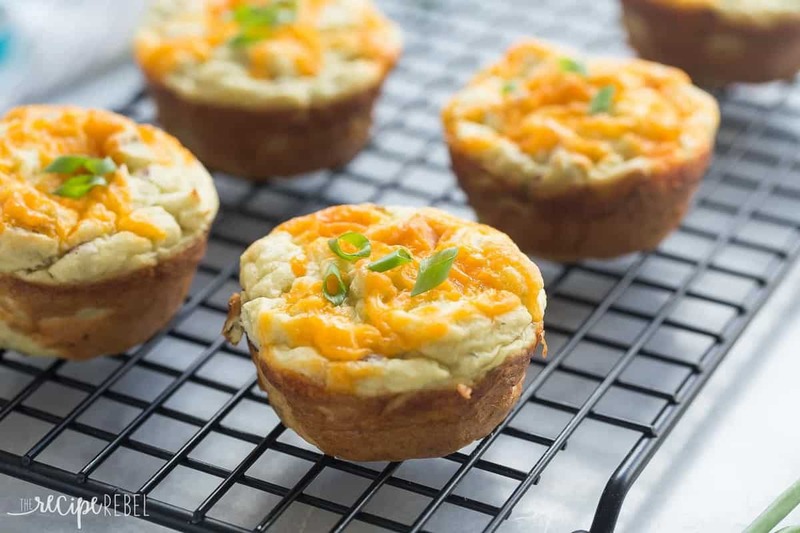 My kids LOVE the cheesy surprise in these Cheese Stuffed Mashed Potato Puffs! Leftover mashed potatoes make these SO easy (or use fresh!) 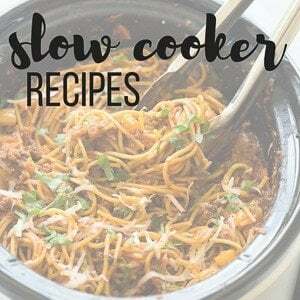 — perfect make ahead side or appetizer for holiday gatherings. First off, I want to apologize for my use of the word “holiday” in the description above. 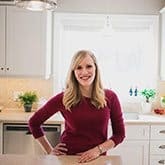 I did it purely for those of you who will be searching for holiday recipes in the future, so that if you’re looking for a great make ahead holiday side, you will actually be able to find it. Later. 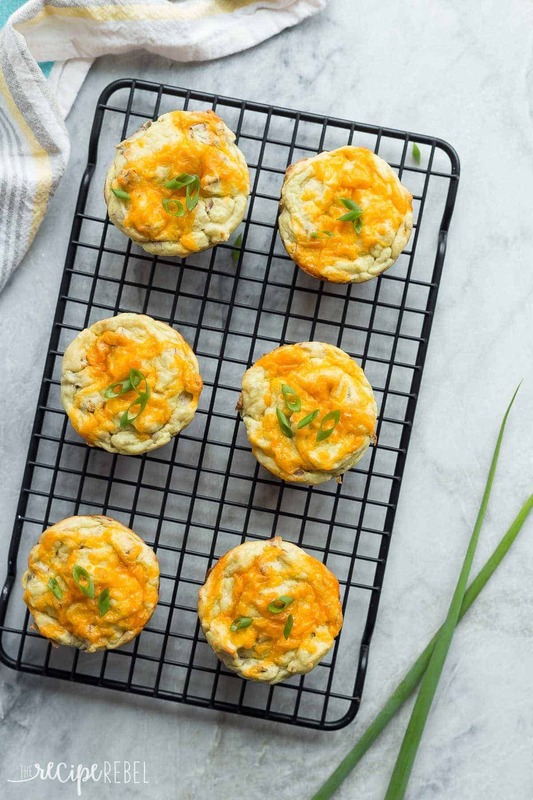 But, there’s nothing wrong with enjoying these creamy, fluffy, cheesy bites, on a regular basis, spring, summer, fall and winter. Second, I know I am a horrible nail-painter. Now we can just leave that alone, right? 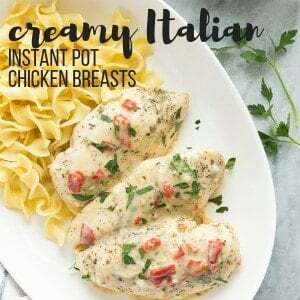 I thought these would be a super fun recipe to make with the kiddos — well, my 4 year old anyway. I know for a fact that if my 18 month old was helping with these no cheese would have been stuffed into the potato puffs. They would have all been stuffed right into her mouth. My kids have a thing with cheese. Do all kids? Or is it just mine? It borders on an unhealthy obsession. If they see cheese — anywhere — you won’t get them to eat anything else. “Cheese” was one of the first words for both of our daughters. So I knew that they would love these potato puffs! And anything make ahead that can make leftovers new again? That’s creamy, and comforting and cheesy? Well that’s a win in my books. 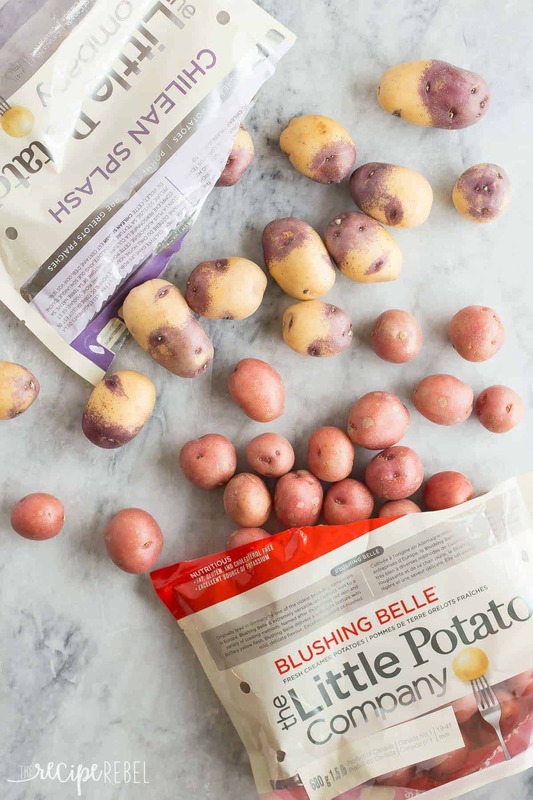 You can absolutely use freshly mashed potatoes, and that is what I did in this recipe, with a bag of perfectly creaming Blushing Belles from The Little Potato Company. But the recipe is perfect for using up those — dare I say it again? — holiday leftovers. You will just adjust your seasonings to your tastes before adding the eggs! I was also super excited to see my grocery store carrying the Chilean Splash! Have you tried them yet? I can’t wait! 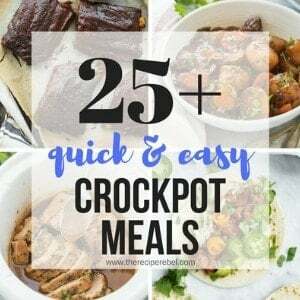 This recipe was created as part of my ambassadorship with The Little Potato Company — thank you for supporting the brands that help me bring you allllllll the delicious things! 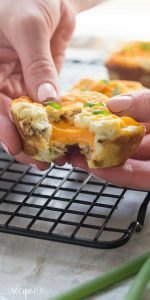 My kids LOVE the cheesy surprise in these Cheese Stuffed Mashed Potato Puffs! Leftover mashed potatoes make these SO easy (or use fresh!) 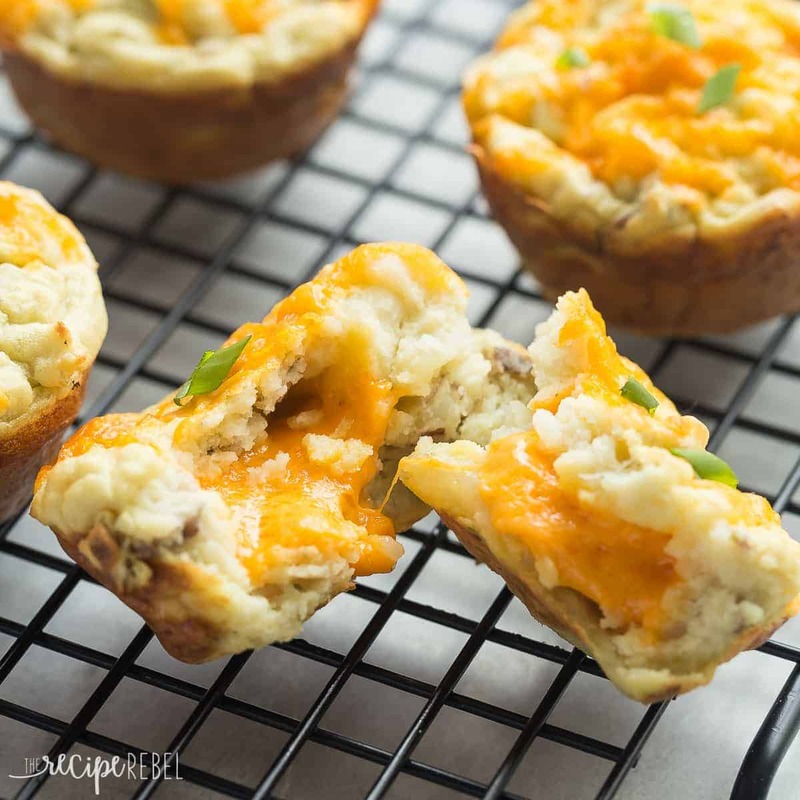 -- perfect make ahead side or appetizer for holiday gatherings. In a large pot of boiling salted water, cook potatoes until tender, about 12-15 minutes. Mash with chicken broth, season with salt and pepper, Italian herbs and garlic. Taste and adjust seasonings as necessary. (*NOTE: if using leftover mashed potatoes, you will likely skip straight to the next step). Let cool. Preheat oven to 400 degrees F and lightly grease a metal muffin pan (I made some in a silicone pan, but they do not brown the same way!). Stir in eggs until completely combined. Spoon enough into each of the 12 muffin cups to cover the bottom. Place one cube of cheese in the center of each (don't push down!) muffin cup. Cover with enough potatoes to hide the cube of cheese. Sprinkle the tops with remaining cheese. Bake at 400 degrees F for 20 min until lightly browned. Let cool for 3-4 minutes before removing from the pan. Serve with sliced green onions as desired. 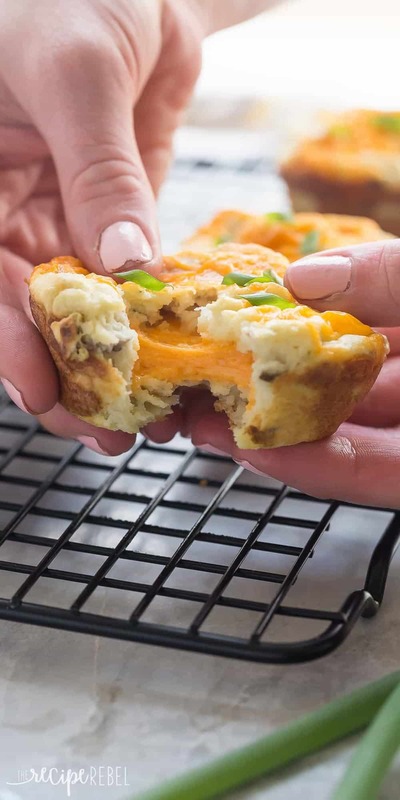 I used a regular muffin pan, but you could also make 24 mini muffin sized potato puffs for appetizers! Stir in eggs until completely combined. Spoon enough into each of the 12 muffin cups to cover the bottom. Place one cube of cheese in the center of each (don’t push down!) muffin cup. Cover with enough potatoes to hide the cube of cheese. Sprinkle the tops with remaining cheese. Sorry the giveaway is now over, thanks for entering! Can you give me an approximate amount of leftover mashed potatoes that can be used in place of making fresh? Thanks, these look great. I’m a big fan of most potato dishes, but my favourite is mashed potatoes with gravy. 🙂 Thanks! I like potatoes cooked ANY way. I especially like scalloped potatoes with lots of cheese, though. I absolutely love potatoes sliced up with onion and mushrooms, carrots salt and pepper and butter wrapped in foil and done on a bbq or in the oven. Makes my mouth water just talking about them. My family has been making potato cakes (skillet method) forever. YUM! Your recipe sounds DELICIOUS!! i love shepards pie. i make it weekly in my house! I love potatoes ALL ways! I do love cheesy hashbrown potatoes a lot. Do french fries count as a potato dish? Well, they are in my house. I’m definitely going to try your recipe and add some green onions from my garden and some crumbled bacon. i can’t wait for dinner time! My favorite potato dish is homemade tater tots! I love roasted baby potatoes smothered in butter, sour cream and chives! I make a deep dish pizza that’s a twist on potato skins. I place the dough in a pan, add mashed potatoes (I like to leave them somewhat lumpy, rustic sort of speak) and top them with caramelized onions, bacon, roasted garlic and smoked cheddar. I serve it with a side of salsa. My fave potato dish of all time is potato pancakes. Parmesan Potato Rounds is a recipes I’ve been making for years and a family favorite. “Twice baked potatoes” loaded with cheese and bacon ! Such a tough call, but I’m going to say new baby potatoes with dill and butter. Potato skins! With cheese, bacon and sour cream to dip. Oh wait potato salad. How to pick just one? Potatoes are delicious so many ways! One of my faves is baked potatoes with chili, cheddar and sour cream. If I haaaaave to eat savory (sniffle), my fav potatoes are sliced from end to end, not all the way through ( like an accordion :)) with sliced fresh garlic in each slot, drizzle with olive oil, sprinkle with sea salt and fresh cracked pepper. Bake like 375 35-45 mins. Cheesy Potato Casserole or scalloped potatoes are my favorite. We love potatoes! I love all potatoes anyway but twice baked potatoes are my favourite! My favourite potato dish of all time is scalloped potatoes. Thank you for the giveaway! These look so delicious!! Love how cheesy they are! I love potatoes! I think scalloped potatoes are my favorite. Cheese and potatoes are such a great match! Love these puffs! Oh my goodness that cheese stretch though!! You most definitely know the way to my heart when we’re talking about carbs like THESE, Ashley! I want to eat these all weekend!! We love all potatoes!yours look great.will make this weekend. My favorite potato dish is Japanese style potato salad. I love garlic mashed potatoes. French Fries will always be my favorite potato recipe. A classic that I can enjoy at just about any meal.